Harkening back to the sixties, the heyday of surfing in Southern California, and borrowing from surfing's deep roots in woodworking, Tower brings you the Windansea, a stylish, handcrafted layered Vermillion and Black Walnut surf style sunglass with spring-loaded brass hinges. It's an unmistakable beach lifestyle fashion statement, where natural beauty dovetails with the finest lenses on the market. Situated just up the coast from our Southern California office, Windansea is a scenic point break with a long, rich history in the affluent beach town of La Jolla, "the Jewel." A palm thatched hut was built on the rocks overlooking Windansea beach in the 1940s. 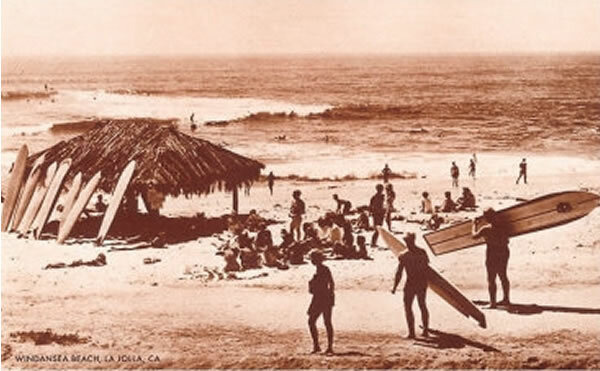 The "Shack," as it's known, still sits there today nearly 75 years later and is a surf icon known worldwide. The combination of the tropical hut, the scenic Mediterranean affluent beach house architecture, and an idyllic sand and rock formation beach contribute to make this one of the most photographed beaches in the world. In the sixties and seventies, Windansea became more and more known as a fiercely local place. There's an infamous picture of a cement pump house tagged with, "Warning!! Windansea may be hazardous to tourists." That would be funny if it weren't so true. The danger wasn't just from the surf zone, but rather from the locals who frowned upon outsiders sharing their home surf break. That's the funny thing about surfing - it's a beautiful, graceful, playful sport practiced by earth-conscious laid back dudes, yet done in an often dangerous, unrelenting, and sometimes deadly environment. It's a powerful dichotomy, and likely the birthplace of the modern extreme sport movement. Our Windansea wood sunglasses, a beautiful, and polished finished product made of very different layers of wood sandwiched together, speak to this unique dichotomy found in the surf world. It's a beautiful collision.